Joyce A. 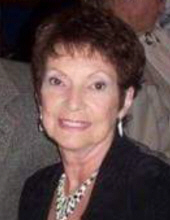 (Salvati) Johnston, 77, of Temple, passed away Friday, August 24th, at Reading Hospital and Medical Center, West Reading. Joyce was born in Reading, on July 13, 1941, a daughter of the late Ruth (Brunnel) and Lewis Salvati. She was the wife of Ronald D. Johnston. Joyce graduated from Reading High School. a sister, Nancy Morgan, of Blandon; and a brother, Eugene "Butch" Salvati. She is also survived by 14 grandchildren and 12 great-grandchildren. A Religious Service will be held at 11:00 AM on Wednesday, August 29th at Sanders Funeral Home & Cremation Services Inc., 1501 North 11th St., Reading. Friends may call from 10:00 AM - 11:00 AM at the funeral home. Interment at Berks County Memorial Gardens, Fleetwood. In lieu of flowers contributions may be made to: Reading Dialysis Patient Fund, 965 Berkshire Blvd., Wyomissing, PA 19610. To send flowers or a remembrance gift to the family of Joyce A Johnston, please visit our Tribute Store. "Email Address" would like to share the life celebration of Joyce A Johnston. Click on the "link" to go to share a favorite memory or leave a condolence message for the family.